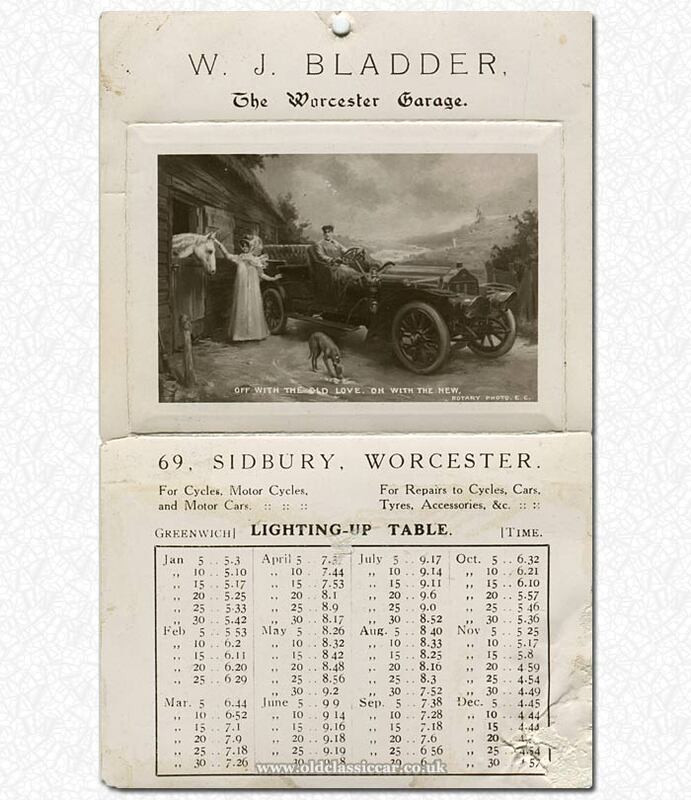 Mr W J Bladder of The Worcester Garage. Homepage. This page: A handy reminder given out by an early 20th century garage. The given address for The Worcester Garage is 69 Sidbury, in Worcester, and the proprietor is named as W.J. Bladder. In its early days, this was a well-known bicycle and later motorcycle emporium, purveying a variety of machines from their main road position. In the early 1900s the cycles on sale at "W.J. Bladder - The Sidbury Cycle Depot" included those by well-known makers such as Swift, Rudge Whitworth, Humber and Raleigh, while they also built and retailed their own machine under the name of Worcester Road Cycles. Accessories too were available, for both cyclists and those keen on new-fangled motor-cars, which were becoming a more common sight on the roads of Worcestershire at the time. Indeed, the garage sold cars, in addition to bicycles and motorcycles, as well as offering a repair service. This item of ephemera is a lighting-up table, offered by the garage to motorists as a reminder of when they might need to ignite their car and motorcycle lamps. The illustration shows a chap sat in a sizeable vintage car, while his good lady tends to a single-horsepower mode of transport. The legend reads: "Off with the old love, on with the new", presumably a reference to the horse having been pensioned off, to be replaced by a shiny new motor-car. The business was finally sold off to Skellerns Motorcycles in 1986. Skellerns continue to sell motorcycles from a nearby location, the original shop premises having been demolished by this time, thanks to local highway re-development work. Their current address is given as 52 Sidbury. As a footnote, the 1928/1929 RAC Handbook gives the W.J. Bladder garage's address as 52 Sidbury, so presumably by the late-twenties they'd either opened a second shop, or else moved from 69 Sidbury down the road to number 52. More motor-trade related items can be found in the Motoring Collectables section, here at OCC.